Our self Mr.chetan vadhaiya & Mrs. Mital Vadhaiya, requesting you to look into this issue ASAP & give us solution & our money back. At that time Gopal told us you will get welcome call next day i.e. 26th of march 2017, but we didn't received any call till last week of April. 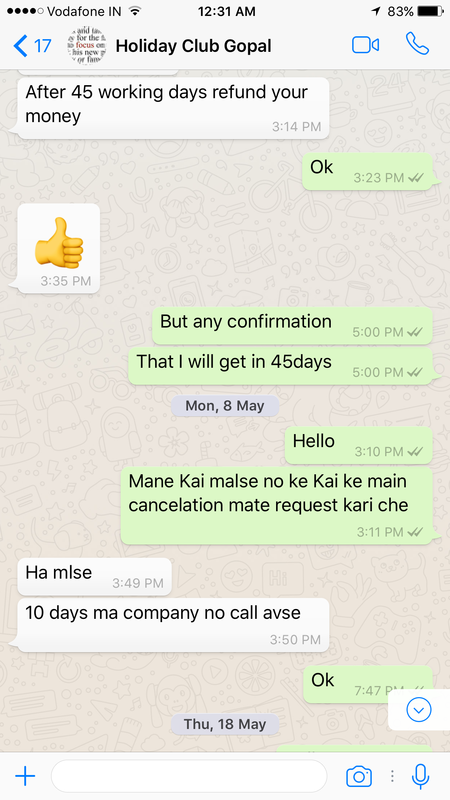 We got call from Goa office on last week of April same was accepted by sheeja,Jane and Gopal .this mistake has been done by your members only. During welcome call she informed us to pay Rs 7500 per year for AMC and she had asked us do know this ? Actually this was not mentioned to us at the time of policy purchasing and it was shocking for us from where this amount has came. After that we had tried to call Gopal and Sushil but there phone were not reachable. After that we had massaged to Priya on what's app. She told us that don't worry we are here to help you, we explained everything to her about Rs 7500 every year I have to pay for AMC. Which I don't know . 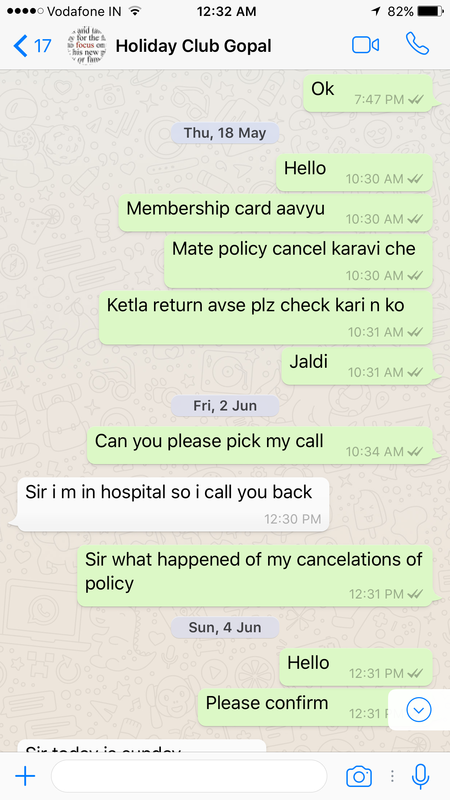 She told us that I am on leave , so we have asked her to give managers mobile no, she had denied to give the managers contact detail.after few hour Gopal callled us and I told him about AMC charges he told me that I have to pay, but I told him that at the time of purchasing policy you Didnt mentioned us that I have to pay for AMC , so I denied and told him to please cancel my policy and refund my money back. After that he said please write one mail to me for cancelation. 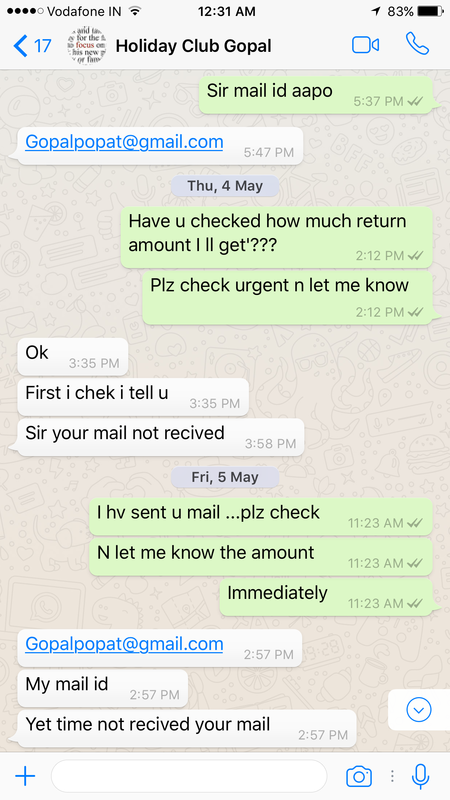 On 5th may he had given his mail id and I sent a mail regarding cancelation. 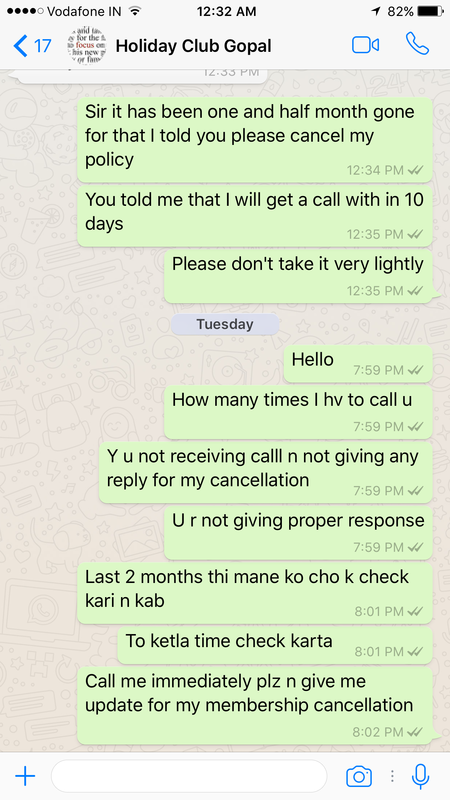 After receiving my mail he has given me a confirmation that you will get call from cancelation department with in 10days and within 45 working days you will get your amount back. For the proof I am attaching screen shot of mine and Gopal conversation on what's app. After this conversation we were waiting for call for cancelation of our policy. Like this 10 to 15 days had been passed away. And we were worrying about our memberships cancelation. After that my wife has called to sheeja and informed her about this issue . So sheeja said cancellation is not possible. After arguing she gave freedy's(manager) no. My wife has called to freedy & informed him for the same. He said ok no problem ,tomorrow I am going to office & will discuss same issue with Gopal & he will give you call. Days were passed & June month came. We were waiting for Gopal's call but he didn't call us n even didnt answered to our call. So we were trying to call freedy to take any confirmation. But he was telling us that I have asked Gopal to check & gives u call. They both were making us fool & we didn't get any proper response from them. Now before 2 days Gopal has called us from Freddy's mobile &. 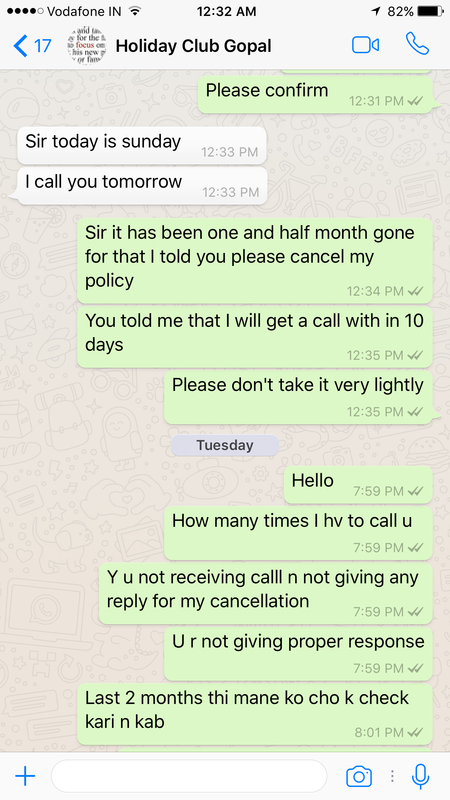 Was telling that now cancellation will not be possible because the reason you are giving is not valid . 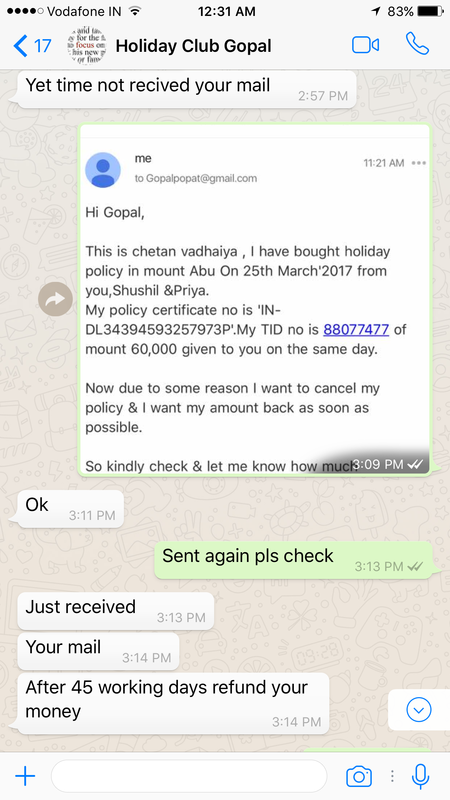 But you can do one thing you go to mini vacation 3 days & if you will not like our facilities then I will cancel your policy & give full amount back.So we had asked Gopal to give this in mail & keep Freddy , mgmt team all in loop. So he said yes I will give you mail confirmation but still we didn't received any mail from him n Freddy. All this conversations we discussed with sheeja n Jane so they both were telling we are not believing in Gopal & freedy's fake promises at all. As they have done like this with many customers. Now we are requesting to mgmt team & HO Department take this case as a fraud case & give us proper response ASAP & also refund my amount back . 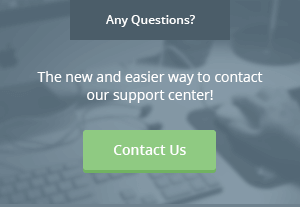 I am no more interested for this membership and also fed up for not giving proper responses.